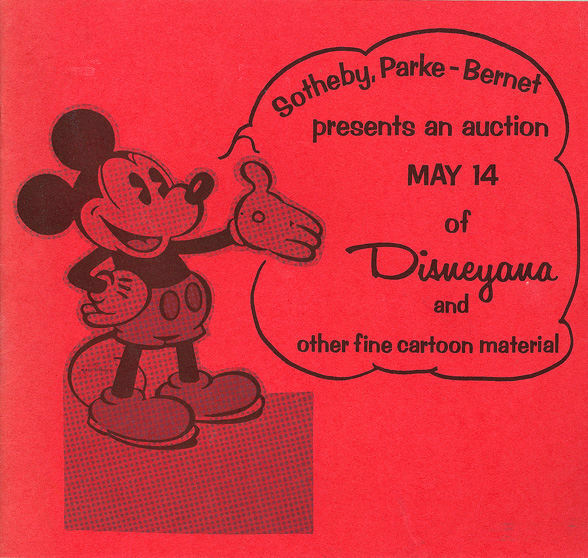 On May 14, 1972, the first auction of Disney memorabilia, known as “Disneyana,” was held by Sotheby’s in Los Angeles, California. Disney memorabilia had been around since the late 1920s, when merchandise featuring Mickey Mouse was sold, ranging from plush toys to watches. The term itself came into prominence with the 1974 book Disneyana: Walt Disney Collectables by Cecil Munsey. The auction contained nearly 200 items, although some items were other cartoon memorabilia pieces. The Disney pieces range from a Mickey and Minnie alarm clock, a watering can, watches, cels from Snow White and the Seven Dwarfs and Bambi signed by Walt Disney, and figurines. The pieces were from the collections of New York businessman Robert Lesser, and Kay Kamen, who helped created the whole licensing industry through his work with Disney. Posted in Uncategorized and tagged 1970s, Auction, Merchandise, Mickey Mouse, The Walt Disney Company. Bookmark the permalink.